Qualcomm just issued a press release reminding us why a lot of modern smartphones seem to be charging much faster than before. 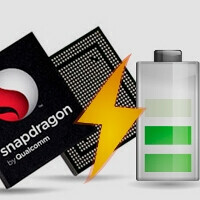 Turns out the culprit is none other but the Quick Charge 1.0 tech that Qualcomm acquired when it bought Summit Microelectronics last year, and immediately put it to good use in its newer Snapdragon processors. The rapid juicing technology is being already used on phones like the Droid DNA, Lumia 920 or the Nexus 4, and without it those phones would have charged for more than four hours, while now the total time is less than three. Qualcomm says that Quick Charge 1.0 allowed for up to 40% faster charging of these devices, and it is with existing USB cables and wall chargers, rather than proprietary ones that Sony uses for fast-charging some members of its Xperia line. "The rapid juicing technology is being already used on phones like the Droid DNA, Lumia 920 or the Nexus 4, and without it those phones would have charged for more than four hours, while now the total time is less than three." My Note2 with the massive 3100 mAh battery is full-charged for about 2.5 - 2.75 hours without it. But fast charging is not always good for battery long living. I thought about battery life as well but when you take into consideration the newer battery technology and how most people keep phones for only a couple of years, shouldn't be that bad. Even if it does diminish overall battery performance near the end, batteries are a lot cheaper than they used to be. Exactly. By having a removable battery this isn't an issue at all really. Exactly my Note 2 also charges very fast and we are not using "Quick Charge 1.0", so yeah maybe Qualcomm made something good but Samsung too. The good thing here is that we are reaching new and better technologies, and Qualcomm/Samsung are in the scene. Agree that S3 is one of the best android available in market; but still it does not hold true to charge the battery fully in 1.5 hours ..
Quad Core? Cause mine takes forever. One of the reasons I got an extra battery. US GS3 here. Daul Core.